Notes on the home video releases: 1. Blu-ray + 4k: This 2018 release is a 2-disc set. The Blu-ray disc is of the Extended Edition described below. The 4k UHD disc contains the theatrical release. 2. Special Edition: This is the original release of the film only months after the theatrical release (165 minutes). This version was simultaneously released in DVD, VHS, DVD with Spanish Subtitles & VHS with Spanish Subtitles formats. 3. Superbit DVD: This edition has the same content from the Special Edition remastered for the higher video and audio standards of Superbit. 4. Extended Cut DVD: This edition could almost be thought of a re-release. It again has the same content and extas feature on the Special Edition with one change. The deleted scenes have now been integrated back into the film (175 minutes). 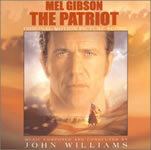 This understated soundtrack was scored by John Williams (Star Wars, Indiana Jones). Unlike some of his other works, it doesn't have any overpowering themes. Instead we are given a few unassuming themes using simple instrumental arrangements that recall patriotic music. The soundtrack features flutes and drums that weave the major themes in and out of the music. It is at times haunting and other times upbeat. It is really the type of score that plays off one's emotions, rather than controlling one's emotions as some of Williams' other scores do.